Tweepi v2.0 :: a geekier, faster way to bulk add quality followers. This is a great tool build quality followers with your Twitter accounts. Twitter only allows you to follow 2000 people, unless the you meet the ratio of following/followers. No one seems to know what that ratio is, but I have felt the wrath of this limit. I have an account where I follow 2000 Twitters, but only have a little over 1200 followers. Twitter will not allow me to follow anymore Twitters. This is were Tweepi comes in to help. Tweepi allows you to flush the unfollowers, reciprocate with those that do follow you, and unfollow those who do not actively tweet. A tool that easily helps in the clean-up and maintenance of your Twitter account. Check it out and let me know your feelings!! Cheers! Engadget repprts “Official Twitter for Android app goes live, will go open source”. The app is really well thought out. Downloaded the Twitter app last night and it has been a joy to use. The home page has a nice layout with tweets, direct messages, lists, and retweets right at your finger tips. The animation of the most popular hashtags simplifies access to them. Nice job by the team at Twitter! ! 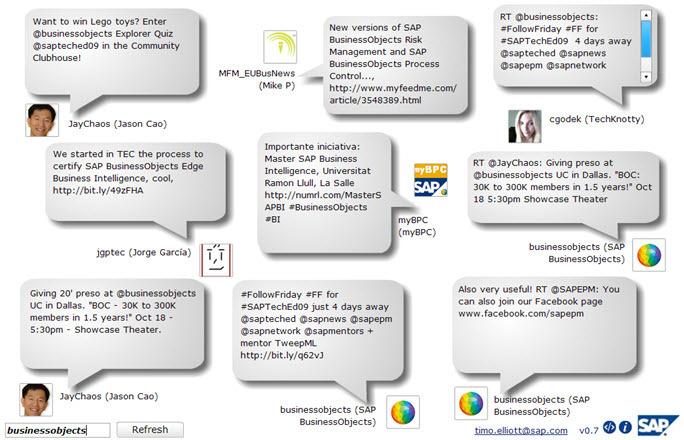 SAP is on the forefront of business use applications and their new Web 2.0 products are the most fun yet. Every conference or event today has a Twitter #hashtag defined for participants to track and trend conversations, so why not use it to create an interactive presentation? The problem. No tools, that is until SAP’s Timo Elliott has created four new products to make your presentation more compelling. SAP PowerPoint Twitter Tools can be downloaded for free, along with a detailed instructions page, and the most crucial information of “best practices” to provide a how-to integrate these tools as part of your presentation. PowerPoint Twitter Ticker – Create a ticker bar at the bottom of your PowerPoint displaying the latest 10 tweets from a defined search string. The search string can be event, presentation, or topic driven which makes interesting real-time results to validate the presentation. PowerPoint Twitter Feedback – Create a PowerPoint page with this tool and replace the typical Question and Answer part of your presentation by having the participants tweet their feedback or questions. Twitter Is Over Capacity – Again! Here we go again. Today, Twitter has had severe problems with service. 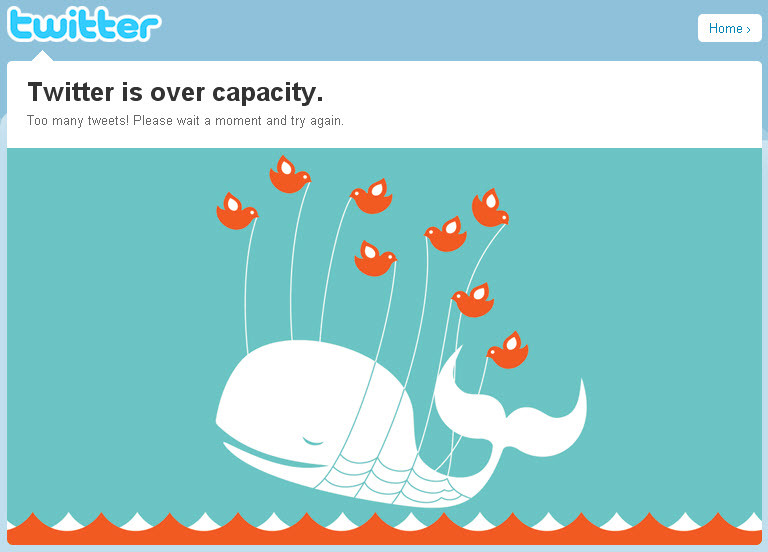 I’ve received the dreaded “Twitter is Over Capacity” message. I have also received Server 503 errors. So, either there is big news out in Twitterland or the scalability issues TechCrunch reported on a couple of weeks is beginning to have an effect. I am going with the later. It has been a week of finding great WordPress Plugins. Today I found a plugin to help me distribute the posting on my WordPress blog to all my social media sites like Twitter, Facebook, Facebook Pages, and LinkedIn. WordPress 2 Ping.fm is the plugin of choice. Ping.fm has become a favorite tool for social media junkies because it allows you to write a post in one location and distribute it to your network of social media accounts. The problem was how to get my blog posts to all my social media accounts. The answer, install WordPress 2 Ping.fm plugin to distribute my blog post to Ping.fm. Then Ping.fm distributes the post to the social media network. Bingo! Create an account on Ping.fm. Add your social media sites by selecting on the “Add To Network”. When at the Dashboard, select Application Keys and copy the long string. 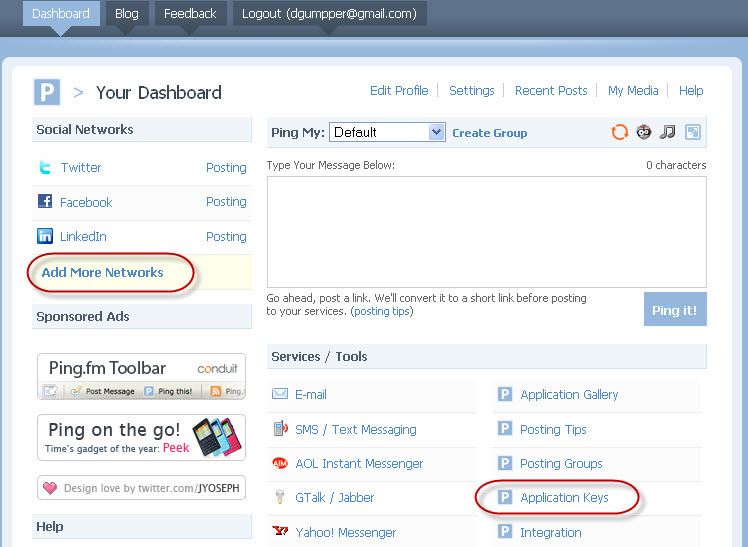 Install WordPress 2 Ping.fm plugin from the Plugins “New Add” in the WP admin dashboard. Select the radio button for All Categories and save. It is that easy. 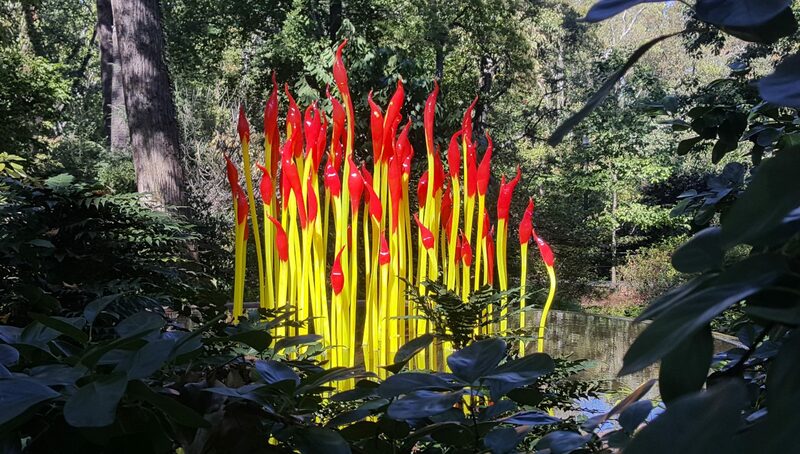 Every time I post an article on my blog, it is distributed to my network of social media sites. I like this one-to-many type of communication. I can simply touch the many social communities that I belong too with a push of one button. Have fun and let me know what you think. Getting the word out on this. It is very important to understand how to extend your brand on Twitter. You are limited on the number of characters available to use for your account name. So, every one is important when you extend the companies brand to Twitter. The link is from Brent Nau’s blog and provides great points on how to Brand Yourself on Twitter | Twitter Tools, Reviews, & News – eINFO.